Doug McSchooler | For The Journal Gazette Central Noble junior forward Meleah Leatherman (20) cries tears of joy after the Cougars won the 43rd Annual IHSAA Girls Basketball State Finals class 2A championship game Saturday at Bankers Life Fieldhouse in Indianapolis. Central Noble won 46-42. 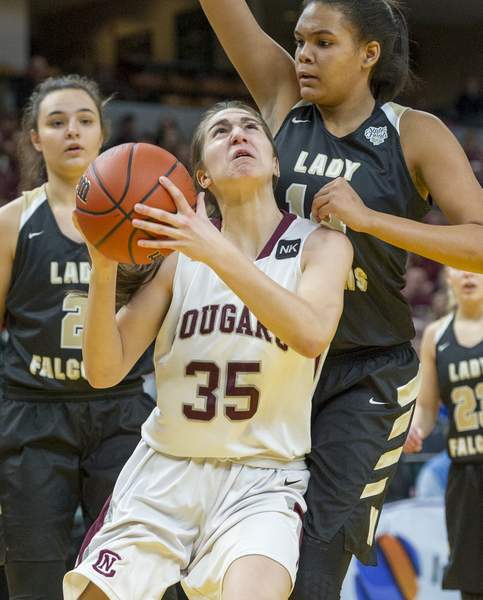 Central Noble High School sophomore forward Sam Brumbaugh (35) tries to get a shot off as she's defended by Winchester Community High School junior center Kira Robinson (14) during the first half of the 43rd Annual IHSAA Girls Basketball State Finals class 2A championship game, Saturday, February 24, 2018, at Bankers Life Fieldhouse in Indianapolis. 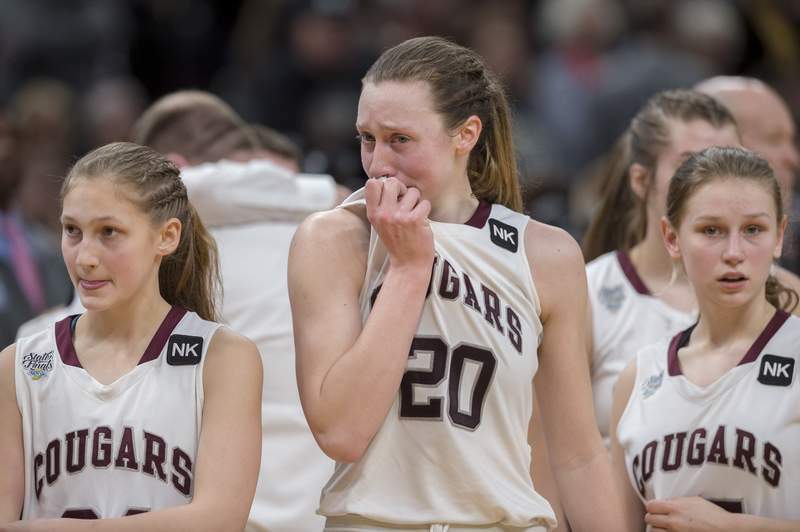 INDIANAPOLIS – Central Noble junior Meleah Leatherman thought about the moment all week, the moment the final buzzer sounded at the Class 2A girls basketball state championship. While she said the moment wasn't exactly what she'd envisioned, it was pretty close as the Cougars won 46-42 over Winchester on Saturday at Bankers Life Fieldhouse. It's the first state championship in any sport for the school. "It was amazing," Leatherman said. "It still hasn't sunk in, yet. Me and (senior) Calista (Rice) were saying, 'did we really just win?' I couldn't believe it just happened." No. 9 Central Noble (23-5) faced No. 4 Winchester (26-3), which had 6-foot-3 center Kira Robinson, 6-0 point guard Maddie Lawrence and 6-0 forward Shelby Miller. The Golden Falcons had the size advantage, but in the end the Cougars had the defense and the speed. "They're a lot bigger in person than they are on film," Central Noble coach Josh Treesh said. "I thought Sydney (Freeman) did a good job of pushing it there during that third quarter. We made a run on them; they looked tired. We did what we do all season. We get just enough cushion to get the lead, and then we hold on to the ball and hopefully good things happen and so far they have." Freeman led the Cougars with 14 points, seven rebounds, six steals, four assists and two blocks, and Leatherman had 11 points, 12 rebounds and two blocks. While the junior duo have led the team all season, freshmen Lydia Andrews and Gray stepped up on the biggest stage. Andrews had nine points, well above her 1.9 points per game she averaged all season, while Bridgette Gray had five points, three rebounds and a block. "With us, it starts defensively," Treesh said. "That's the one area we look at. Lydia does an outstanding job with getting into a defensive stance. I get mad at her a lot because she reaches a lot, but she also gets a lot of deflections. Bridgette does what she does, she did a really good job of looking to score tonight. They do just enough to take the pressure off of (Meleah, Sydney and Calista)." The team's lone senior, Calista Rice, was named the 2A mental attitude award winner. After advancing to last year's semistate and falling short, team put the time and effort in during the offseason. "The thing we talked with the girls about before the game was that these girls have put a lot of hours, a lot of days, a lot of weeks, a lot of months, a lot of years to get to this game," Treesh said. "I'm happy for them because it takes a lot of sacrifices along the way, more so than some of the other sports. "I'm just proud of them that we battled through ups and downs through our season, we stuck together. We believed that we had the pieces to get here and we just put ourselves in a good position. I really believe we played really well once we got to the sectional and we've been pretty consistent throughout." Winchester got within 44-42 with 1:11 left after a 3-point play from Maddie Lawrence but Freeman's incredible recovery of a loose ball and layup with 27 seconds left made it a two-possession game and secured the win. "I was just looking to pass it out but then the ball was hit back and I didn't really have anyone in front of me so I just shot it up and said a prayer," Freeman said of the shot. After being down by as much as 22-15 with 2:10 left in the first half, the Cougars tied the game at 30 at the end of the third quarter and opened the fourth quarter with an 8-2 run to go up 38-32, including the go-ahead bucket from Gray with 6:42 left.